project. This tree house is built on a tree with no supporting branches for the structure. 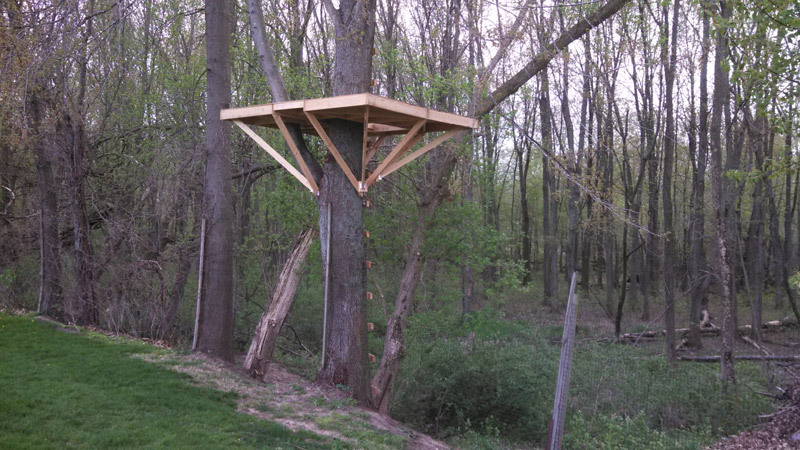 The tree house floor base is supported by braces that are attached at angles to the tree. 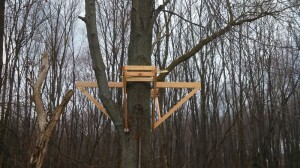 Side view – Because there is a lack of branches in this tree, support braces are attached to the tree itself at angles. Because there is a lack of branches in this tree, support braces are attached to the tree itself at angles. 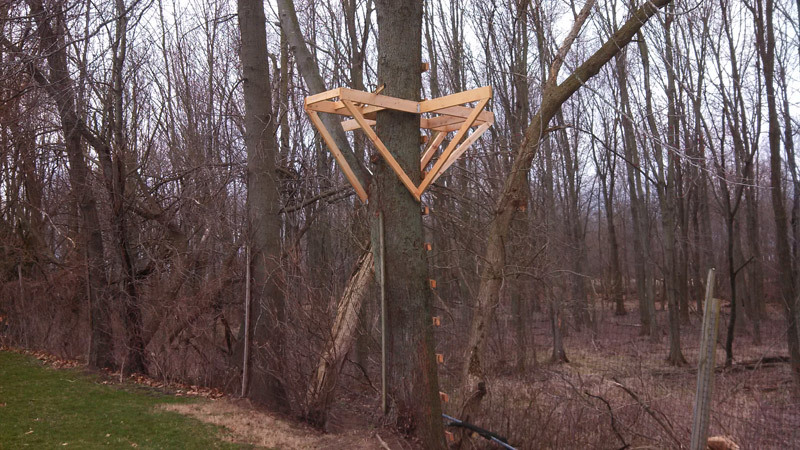 The base floor for tree house building is supported by angled supports attached to the tree. A finished tree house design features safety railing for kids, angled based supports, and ladder attached to tree trunk. Beginning with a basic framing for the tree house floor, this handy father used 2×6’s and 2×8’s for tree house floor joists. 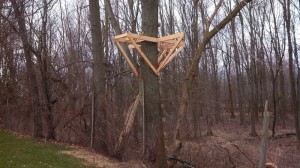 Then at angles, he attached supports to the tree trunk below. As mentioned before, this tree has no major branches on which to build any of the tree house structure. The braces are needed for stability, to hold the weight of occupants. The beginning base was designed in a “+” shape, and then the corners were framed in to make the base more square shaped. From the outermost corners, additional braces were added at angles to the trunk below. This tree house has a railing around its perimeter, with no walls or roof. 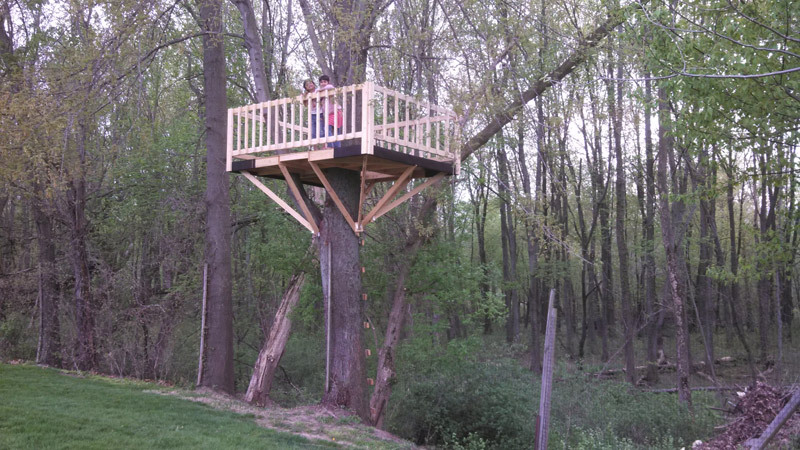 This tree house, not unlike a watchtower will serve as a great place for playing for years to come. Do you build a tree house differently? I’d love to see it. Send your pictures, and a few descriptions to curtis@handyfather.com.